Any visitors to the Sonoran or Mojave deserts have undoubtedly seen desert mistletoe (Phoradendron californicum), but many don’t pay attention to the amorphous dense blobs of green foliage in the canopies of the ironwoods, mesquites, acacias, and palo verdes. Other people notice the mistletoe only as a nuisance. Sure, they can receive up to 80% of their carbon and all of their water and nutrients from those host trees, but being a parasite does not mean a species is lacking in positive qualities. Indeed, a few people, including myself, who travel to desert locales actually seek out this misunderstood native plant. We see it as a crucial and fascinating piece of our local ecology and truly an emblem of the desert scrub habitats of the Southwest. Desert mistletoe provides much-needed resources to our Sonoran fauna in fall and winter. For example, the shiny black, crested bird perched atop a mistletoe-laden tree is likely a familiar sight to many of our local bird enthusiasts. This bird, the phainopepla (Phainopepla nitens), depends on the mistletoe berries. During fall and winter, it will defend a territory rich in mistletoe against other birds in order to provision its young. 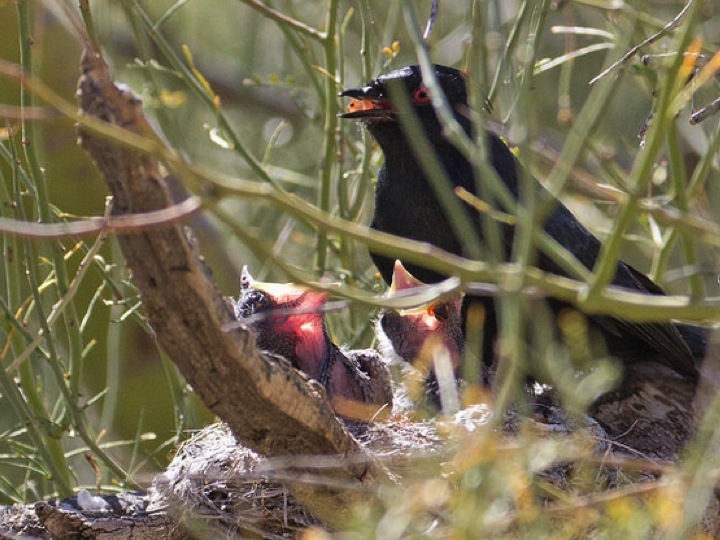 While many species of birds and mammals also feed on desert mistletoe berries, the phainopepla is far and away the most important from the mistletoe’s point of view. The phainopepla has special digestive adaptations that allow mistletoe seeds to pass through them unharmed, so that they can be deposited and establish on the branches of suitable host trees. Therefore, the interaction between the phainopepla and desert mistletoe can be thought of as a mutually beneficial trade of food for transportation. Indeed, when cold weather conditions damage the year’s crop of mistletoe berries, phainopepla populations have been observed to go through precipitous declines. Male phainopepla feeds chicks mistletoe berries. Photo by Doris Evans (flickr: dorisevans). The phainopepla is not the only animal to benefit from mistletoe’s presence. Stealing resources from its host plant, mistletoe is able to flower early in winter when few other plants can. Therefore, it provides a critical food resource for many local pollinators. In fact, in dry winters, locally raised, non-native honeybees will provision their nests almost entirely with desert mistletoe pollen. Without the pollen and nectar provided by this plant many of our native pollinators, such as syrphid flies and solitary bees, would also suffer. Additionally, the dense cover provided by mistletoe in the canopy of trees makes it a preferred nesting site for many of our native birds. Without it, predation of eggs and nestlings would likely rise. Many insects and mammals, including cattle, will feed on the green foliage of desert mistletoe, and the beautiful great purple hairstreak butterfly does so exclusively as a caterpillar. Many mistletoe species have even been found to play a key role in the nutrient cycling of the ecosystems they inhabit, indirectly benefiting a large number of species. In addition to recognizing the ecological benefits of mistletoe, I hope to dispel the unfortunate misconception that desert mistletoe is a voracious “tree killer.” No evidence exists that desert mistletoe can cause the death of a host tree under normal circumstances. Of course, there are many anecdotes about an individual tree that died infected with dozens of mistletoe parasites. Since trees have limited lifespans, it should be unsurprising that trees with heavy mistletoe infections, which have undoubtedly taken decades to establish, will often die. Mistletoe infections should be thought of as more analogous to the common cold for their tree hosts than a devastating plague. The majority of trees get it at some point in their lives and only those that are already sick or otherwise weakened suffer an appreciable increase in mortality risk. Importantly for my work, desert mistletoe provides a unique system with which to understand host-parasite and disease transmission dynamics in nature. We can use desert mistletoe, its host trees, and the phainopepla as a model of vector-transmitted disease. Indeed, it is far easier to track in real time the dynamics of plants and birds than mosquitoes and malaria parasites, but the fundamental processes of natural selection shaping the interactions are the same. We are currently using this system to ask a number of questions such as “How does the behavior of vectors influence how parasites will be distributed in space?” and “Are parasites on different host species different genetically?”. Being able to study these broader questions with a plant that serves as an important keystone member of its ecosystem makes our work even more exciting. From the 1908 book, Camp-fires on Desert and Lava by William Temple Hornaday. Even after I’ve relayed these amazing aspects of desert mistletoe biology, many people still want to know how to get rid of it. Certainly, I am opposed to any large-scale efforts to remove mistletoe, especially from public lands. However, I respect that many people may be interested in protecting a particular tree in their yard. While chemical products claiming to beat back mistletoe exist, I am unaware of any study supporting their effectiveness at killing the plants or investigating potential negative effects on the host tree. Alternatively, mechanical removal of the visible parts of the plant is simple. The vegetation is often brittle and will break off fairly easily when knocked with a broomstick, for example. However, this method is unlikely to kill the mistletoe, which can re-sprout from the same spot within months. The only way to ensure that mistletoe is dead is to remove the branch on which it grows, a strategy that may cause more damage to your tree than the mistletoe could. Therefore, my advice is to enjoy the benefits of any existing adult mistletoe plants. If instead you are concerned with staving off future infections, brushing off mistletoe seeds before the plants can establish is the best solution. The seeds are white or gray in color and about a quarter inch in length. They can be easily dislodged from the bark, and I would recommend doing so once a year after the plants have stopped fruiting in early summer. 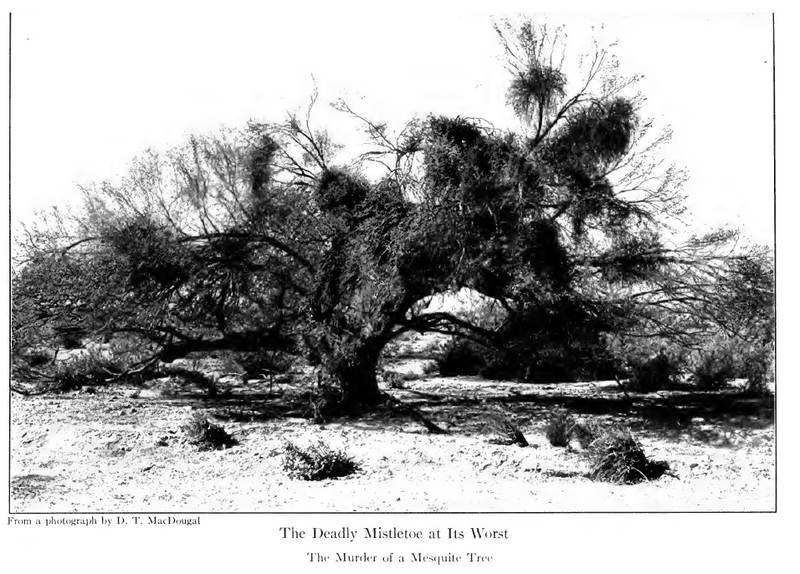 Participating in many interactions with other species, both positive and negative, desert mistletoe is more than just a sap-sucking parasite. In my eyes, it is a species deserving of some of the same reverence many reserve for the mighty saguaros and ironwoods. Thank you for your info — very informative. are there any differences between normal mistletoe and desert mistletoe? There are actually hundreds of species of “mistletoe” from five different plant families around the world, desert mistletoe. Phoradendron californicum, is just one of those species. Desert mistletoe is fairly closely related to the classic christmas mistletoe, Viscum album, a native of Europe. In Eastern North America, Phoradendron leucarpum is a native species often used as a surrogate for Viscum album in christmas decorations. That species is very closely related to desert mistletoe, and all three of the above mistletoes have a very similar ecology in terms of their relationships with hosts, dispersers, and pollinators. In contrast, the dwart mistletoes (such as Arceuthobium) with which many people from the Northwestern United States are most familiar, infect conifers and do not tend to be biotically dispersed, giving them a very different ecological role. In other parts of the world, mistletoes, such as those in the Loranthaceae family, may look very different with showy red, tubular flowers pollinated by birds, but they are still partially reliant on nutrients from their hosts.